Hi! I’m Angie Six. Welcome to Just Like The Number! Just Like The Number comes from a phrase I repeat nearly every time I meet someone new. When you have a last name as simple, yet as unusual, as Six, it tends to confuse people. So I’m Angie Six: just like the number. I may be the mastermind behind this blog, but without my cast of characters there wouldn’t be much material. My husband, Mike, and I have been married for 20 years. Without him, I’d never have such a clever last name to use in my blog. Mike is a salesman by day and a poker player by night. We have two children, Elena (15) and Eli (10) and a rescue dog named Gus. In my previous life I was a medical technologist in an immunology lab. Now I’m a freelance writer and photographer, trying my best not to conduct any laboratory experiments in my kitchen. No, Really, Tell Me More! For the average girl, I am an avid sports fan, especially of the NFL and the Indianapolis Colts . This probably has something to do with the 4000 hours of watching Sports Center I endured as a newlywed. I have an especially unhealthy obsession with Peyton Manning, that landed me a coveted writing spot on Sports Illustrated’s Monday Morning Quarterback. I love to read and usually have books stacked precariously high on my nightstand. In fact, I can’t stand just sitting and not reading something. I have been known to get engrossed in a 5-year-old copy of Car & Driver while waiting for an oil change. I love to travel, and have a list a mile long of places I long to visit. I’ve been told I’m pretty awesome at trip planning, and I love to do it – almost as much as the traveling itself. 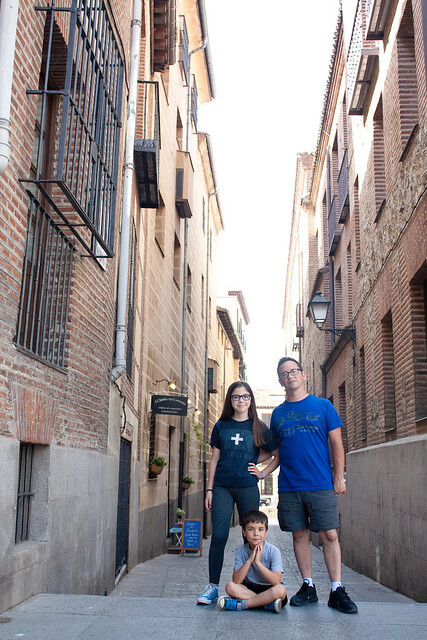 Our family took an epic, month-long trip to London and Spain in the summer of 2014. You can read about it, as well as the rest of our adventures, on my oh-so-originally named Travel Page. My pictures are taken with either a Canon Rebel XSi DSLR camera or my iPhone. In 2010 I took a picture every single day for a year. Two of my photographs have earned ribbons in the Indiana State Fair. They’re not all ribbon-worthy, but you can see my photography on my Flickr page. My favorite food in the whole wide world is a baja-style fish taco. I’ve yet to find anything close to decent in Indianapolis. When I do, choirs of angels will sing and I can focus my efforts on more serious things, like finding Indy’s best paletas. I love craft beer (thanks to the dear ladies of Girls Pint Out, who took my Rolling Rock-loving self under their wings). No need to impress me with fancy wine, just bring me a growler or a six-pack of your favorite brew and we will be forever friends. If I had to choose one beer and one beer only to drink for the rest of my life, it would be Sunking Sunlight Cream Ale. Counter-tops and flat surfaces that are covered on every square inch give me hives. The Container Store is my happy place. I worked there for nearly 3 years. Yes, my home is pretty darn organized. I also wrote a blog called The Risky Kids. If you pump your fists in solidarity with free-range parents, or you just like to try crazy fun screen-free things with your kids, I think you’ll like it a lot.